You typically only wore a wig as a “last resort.” However, many supermodels and celebrities have been wearing wigs lately; some just for fun, some due to medical conditions. However, many celebrities have become advocates for wigs, constantly posting pictures of themselves wigs on social media. 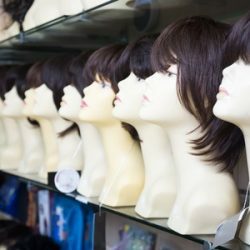 As a result, many women have become interested in wigs as a fashion statement and many women that have medical conditions have started to feel a bit more comfortable wearing wigs. Years ago, women would often avoid drawing attention to the fact that they were experiencing hair loss and would not wear wigs in fear of drawing attention to themselves. However, with celebrities such as Beyoncé normalizing wigs in mainstream media, many women are willing to wear wigs to address their hair loss issues or simply to experience with different looks. If you think about it, women change their style up on a daily basis. We often change our makeup, clothes, and shoes, so why not switch up our hair to match our current preferences? Whether we are wearing a wig to address our hair loss issues or wearing a wig “just because,” we have the right to do so. A lot of women are on board with the concept of wearing wigs and are becoming more and more comfortable with doing so. In the United States, wig sales went up 5.6 percent between 2011-2016. Many celebrities do wear wigs because they suffer from hair loss, as many women do. Famous actress, Viola Davis, opened up about her own struggle with alopecia areata, a condition that causes a person to lose round patches of hair from their scalp. While Davis often shows off her natural curls, she also switches up her look with wigs as well. Stylistics Inc. is a full service hair salon located in central Phoenix, AZ, Stylistics Inc. offers a wide variety of services for individuals suffering from hair loss.